When dusting a room always start from top to bottom and left to right. Start by dusting the ceiling fans and blinds, dust will be stirred up and will fall to the items below. After all of the higher items and objects are dusted, move to the lower items, such as desks, dressers, and bed frames. Remember to start on the left side of the room and work your way around in a clockwise direction. By working in a circular pattern you will be less likely to miss an item. After dusting the entire room vacuuming is recommended to remove any dust that may have fallen to the carpet or tile. 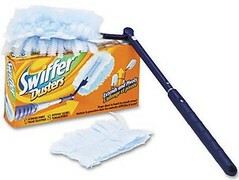 A cleaning product that works well for dusting is the Swiffer Duster. This duster has many soft fibers that make it easy to collect dust. There are several different types of handles, however they are all very similar. If you are thinking of buying one, I would suggest the Swiffer Duster with the extendable handle. This will make it easy to dust ceiling fans and blinds. Another easy way to dust a room is to use a soft cloth and some Endust, or a similar dusting spray. These sprays smell great and pick up dust very easily. The cloth method works well for cup rings and other gunk that may have formed on surfaces. The key to dusting is to do it frequently. A thin layer of dust is much easier to clean up than a large build up. Spending 5-10 minutes, once a week dusting will help you prevent spending hours trying to get rid of a dusty mess.